Din categoria "How it's made" cred ca trebuie sa faca parte si o reteta de paine alba simpla. La mine in familie nu se facea prea des paine de casa, asa ca dupa ce am venit in Canada am cautat pe internet retete de paine pana m-am lamurit care e procesul de preparare. Credeam ca e o povara sa faci paine, ca dureaza mult si e dificil, dar dupa ce am facut-o pe prima, nu am mai cumparat paine decat foarte rar si de aceea m-am gandit ca o reteta cu poze pas cu pas pentru paine, ar face sa fie mai putin "scarry" prepararea ei (ma refer desigur la cei care nu au masina de facut paine, pentru ei e mult mai simplu :). Sper sa va ajute pozele! Eu fac de obicei cate 2 paini odata, si de aceea pozele arata o cantitate mai mare de aluat si 2 tavi in loc de una. Este bine ca drojdia sa fie la temperatura camerei. Mai intai preparam maiaua: intr-un bol mic punem drojdia zdrobita, zaharul si 300 ml apa calduta (nu fierbinte!) si o lingura de faina. Amestecam bine, punem un stergar deasupra peste bol si lasam vreo 15 minute pana cand maiaua isi dubleza volumul. daca drojdia este proaspata si de buna calitate, maiaua va creste frumos, in cazul in care nu creste, nu va mai obositi sa continuati, pentru ca nu va creste painea). Adaugam maiaua in faina din bol. Incepem sa framantam, adaugam uleiul si framantam pana cand aluatul se ia de pe peretii vasului. Eu nu framant decat pana se inglobeaza toata faina. Pregatim 1 tava (eu folosesc de chec, imi place painea in forma de franzela, dar puteti sa folositi orice tava doriti, depinde de forma pe care vreti sa i-o dati). Scoatem aluatul din bol, si il framantam 1 secunda, si ii dam forma dorita. Il asezam in tava. Preincalzim cuptorul la 195 grade Celsius sau 390 grade F). Lasam sa creasca inca vreo 30-45 minute, pana cand ajunge sa depaseasca putin tava (acoperim cu stergar tava). Mie imi place painea nu foarte inalta, asa ca nu o las sa creasca exagerat. Dupa 40 min..
Dupa 40 minute, scoatem painea pe un gratar si lasam sa se raceasca. Observati ca una e mai mica si una mai mare :))) niciodata nu reusesc sa modelez in mod egal fiecare paine :) Dupa ce s-a racit, puteti taia felii, yummy!!! Si ca sa vedeti cat e de pufoasa...Voila! Nu sa-mi laud singura marfa, dar e perfecta!!! pufoasa si aromata, cu o crusta delicioasa! Sper sa va placa painea, caci e tare buna si merge cu orice! 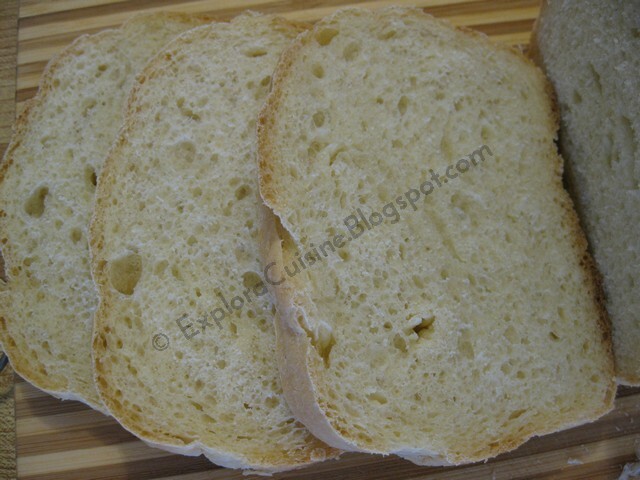 In the category "How to" I believe a simple white bread recipe must be included. 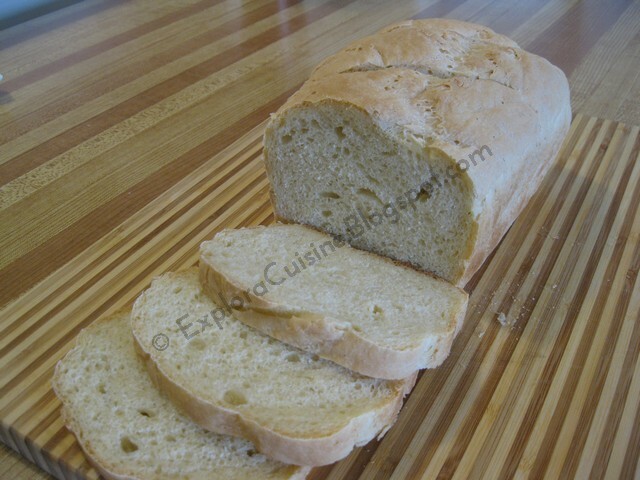 In my family bread wasn't made very often, so when I came to Canada I searched the Internet for bread recipes until I figure it out how to do it. I thought it was a burden to make bread, that it takes a lot of time and it's difficult, but after I did my first one, I havn't bought bread but on very rare occasions and so I thought a step by step recipe for bread with pictures would make it less "scary" preparing it (I refer of course to those who don't have a bread machine at home :). I hope the pictures will help! 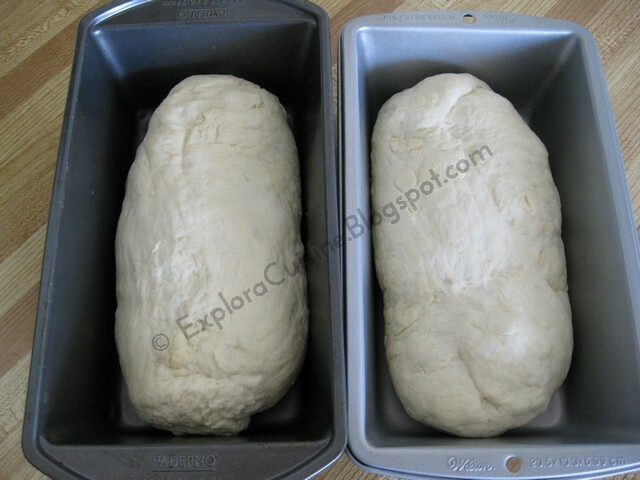 I usually make 2 breads at a time, and that's why the pictures show more dough quantity and 2 pans instead of one. It's best if you use the yeast at room temperature. We First prepare the yeast mixture: in a small bowl crumble the yeast, add the sugar and 300 ml warm water (not hot) and 1 tablespoon of flour. Mix well, put a towel over the bowl and leave it for about 15 minutes until yeast doubles its volume. If the yeast is fresh and a good quality one, the yeast mixture will grow nicely( if it doesn't increase, don't bother to continue). 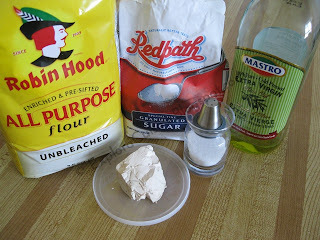 We add the yeast in the bowl where the flour is. We add the oil. We knead the bread until it all comes together. We can sprinkle some flour if it gets to sticky. 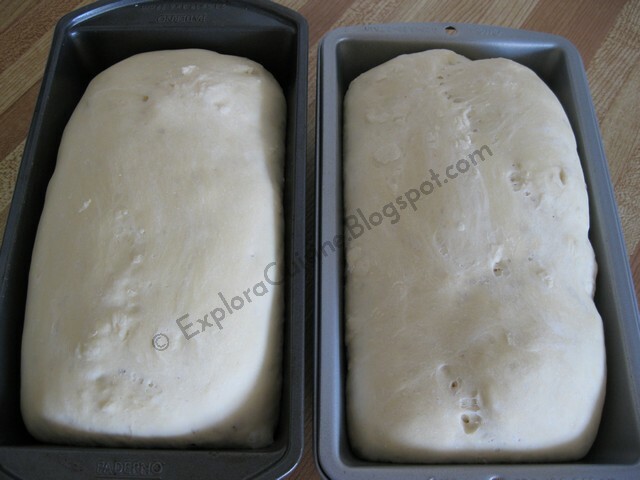 We prepare a pan (I usually use a loaf pan, because I like the bread to have the shape of a loaf, but you can use any kind of pan that you like, depending on the shape you want it to have). 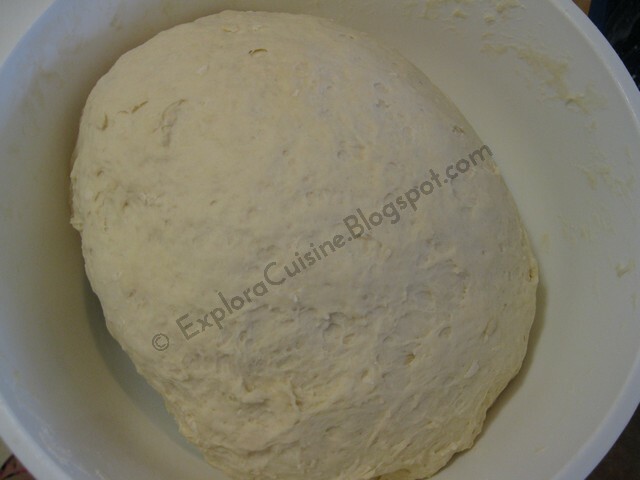 We knead the dough for a second, and we give it the shape we want, we place it in the pan. We preheat the oven at 390 degrees. 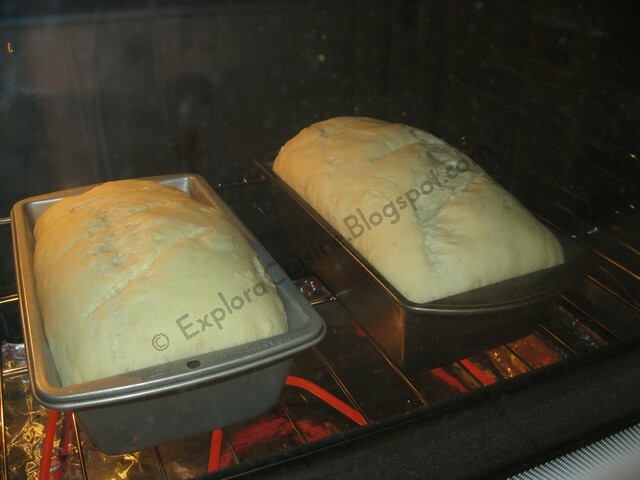 After 40 minutes, we take the bread from the oven, and we place the bread on a rack to cool down. You can see that one is bigger and one is smaller, because I can never make them equal from the start :)). After it cooled down, we can slice it. Yummy! 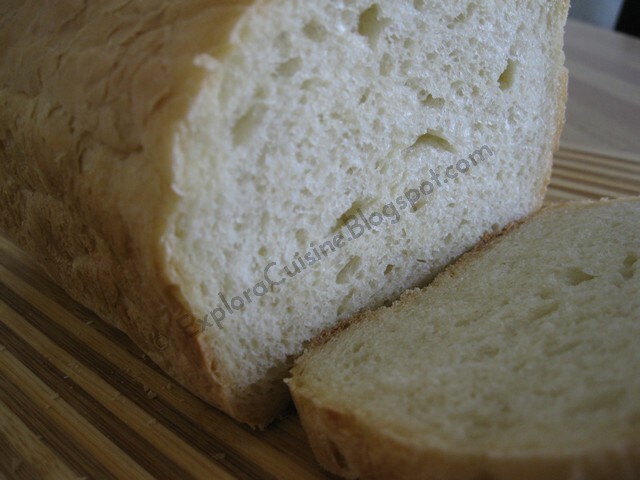 It has a beautiful flavor and it's very easy to make, I hope you try it! 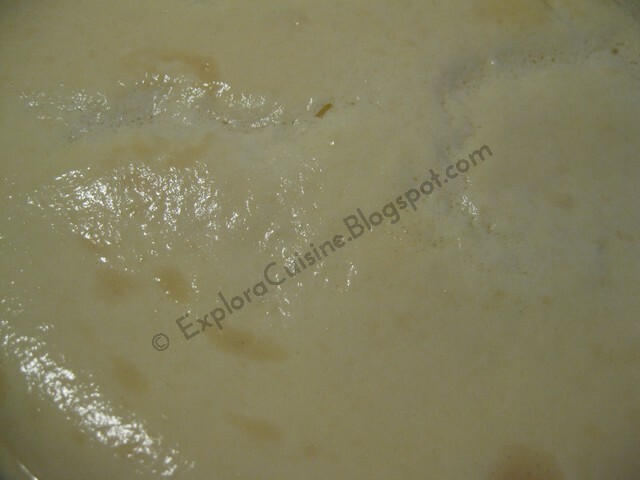 Posted by Alina---Explora Cuisine at 11:56 a.m.
megi February 28, 2011 at 3:01 p.m. 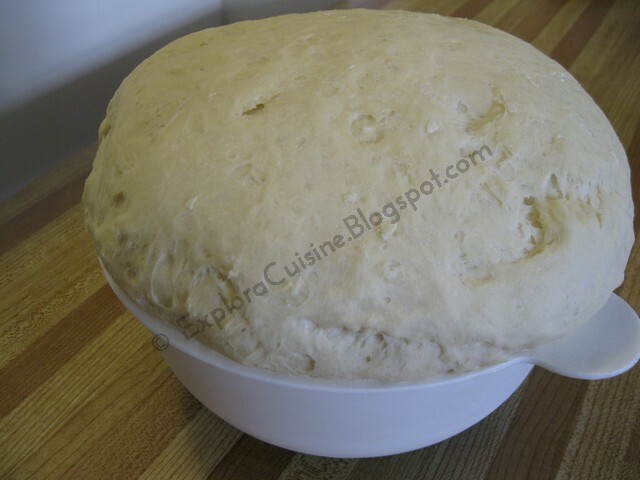 There are few things as relaxing as kneading dough, I have been making our bread from scratch for almost ten years now and I love it. 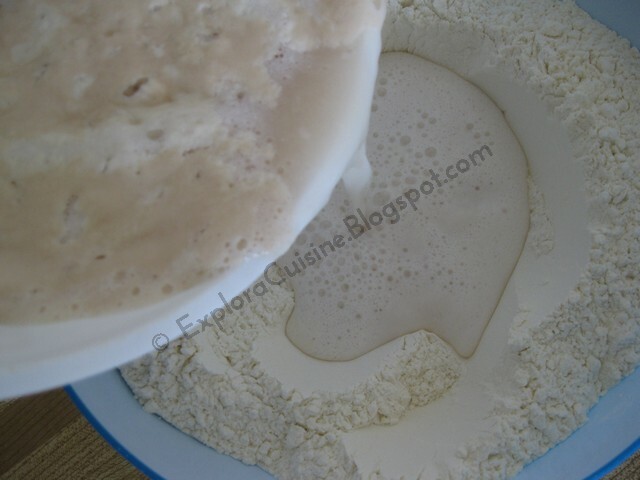 I started with regular yeast, now I am using sourdough starter most of the time. 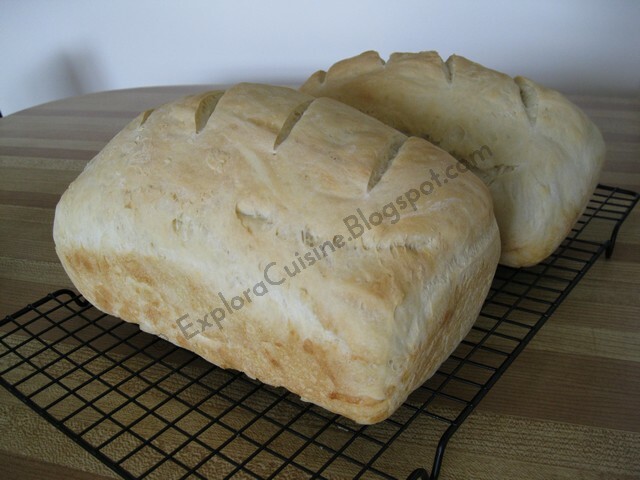 The loaves look so delicious. Explora Cuisine February 28, 2011 at 3:20 p.m. Thank you Megi, they do look great and they taste wonderful, you can't compare home made bread with those you find at the supermarket...after I finished my first one, my husband was amazed how good it tasted and since that day I rarely bought bread :) for me it's been only like 2 years, but still :) Hope you have a lovely spring start tomorrow!!! megi February 28, 2011 at 6:29 p.m.
Eileen March 1, 2011 at 1:46 p.m.
Explora Cuisine March 1, 2011 at 3:20 p.m. Anonymous March 4, 2013 at 10:00 p.m.
sera 72 May 4, 2014 at 3:51 a.m.
oana September 26, 2015 at 10:22 a.m. Unknown November 4, 2016 at 1:24 p.m.
Multumesc pentru vizita facuta si sper ca ati gasit ceva pe placul vostru!